Be the first to share your favorite memory, photo or story of Glennice. This memorial page is dedicated for family, friends and future generations to celebrate the life of their loved one. A graveside service for Glennice Cameron, age 97, of Jacksonville, is scheduled at 2 o’clock in the afternoon Thursday, October 25, 2018 at Resthaven Memorial Park in Jacksonville. Rev. Sonny McFarlin will officiate. Services are under the direction of Autry Funeral Home in Jacksonville. She passed away Sunday, October 21, 2018 in Jacksonville. 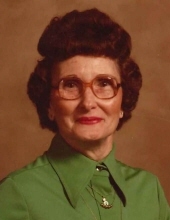 Glennice was born January 31, 1921 in Guntersville, Alabama to the late Will and Beatie (Beam) Hayes. She was preceded in death by her husband, Albert Cameron. Glennice is survived by her daughter, Martha Gregory; grandsons, Gregg Gregory and wife Karen of Troup, Jim Gregory and Joann Alexander of Jacksonville; granddaughter, Kathy Essex of Jacksonville; four great-granddaughters: Lindsey Quanilty, April Sadler, Amy Gregory and Jennifer Reyes; two great-grandsons, Stevie Essex and Joshua Essex. She also has seven great-great grandchildren: Hunter Essex, Cameron Sadler, Lindsey Kay Sadler, Taylor Pearl Quanilty, Caiden Reyes, Tray Reyes and Karleigh Essex; and two great-great great grandsons, William Essex and Eli Sadler. Visitation will begin on Wednesday, October 24, 2018 and friends are cordially invited to visit with Glennice’s family from 6 to 8 o’clock in the evening at Autry Funeral Home, Jacksonville. "Email Address" would like to share the life celebration of Glennice Cameron. Click on the "link" to go to share a favorite memory or leave a condolence message for the family.